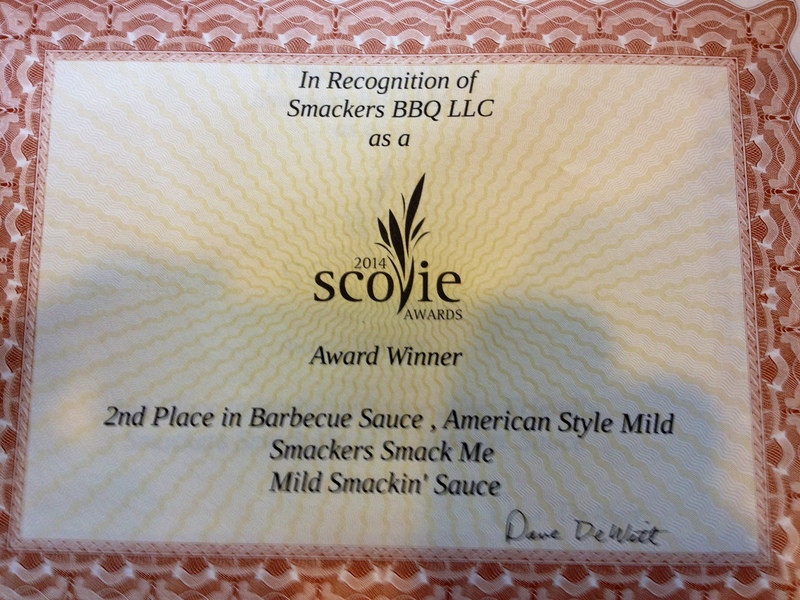 Smack Me Mild BBQ Sauce, 18 oz. 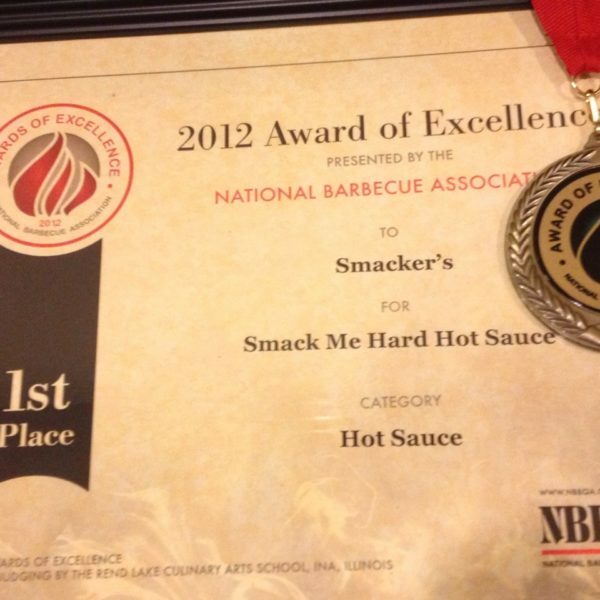 Smack Me Hard Hot BBQ Sauce, 18 oz. 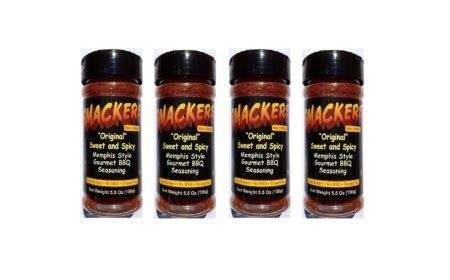 Begin with Smackers Seasoning for your main dish, and serve with a side of each of our perfectly balanced sauces. It's the perfect gift to give yourself, too! 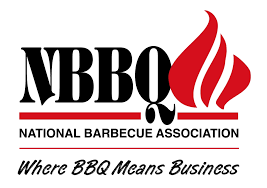 Make sure to check out our Facebook page for recipes and a how-to video that will have you cooking perfect ribs, chicken, shoulders, wings and even seafood like a pro! 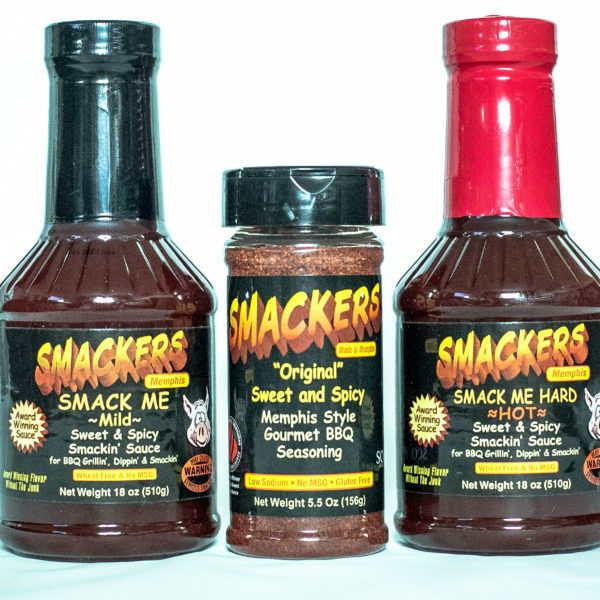 Smackers contains remium ingredients for a full-bodied experience like no other! 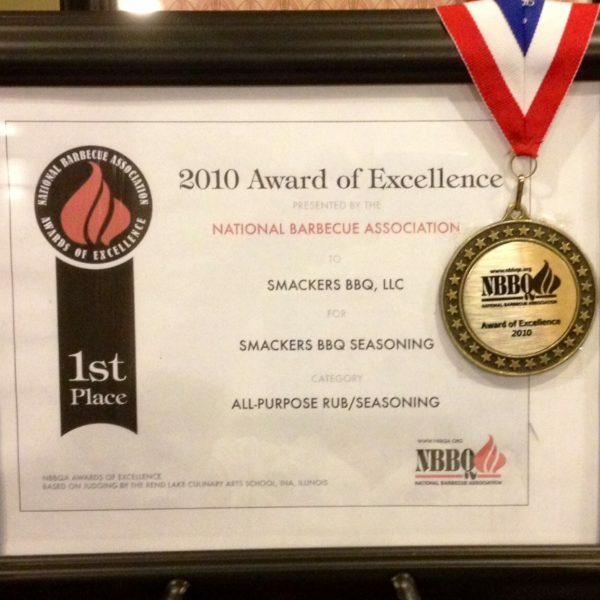 Smackers sauces are made using our award-winning Smackers Sweet and Spicy BBQ Seasoning, so you know you’ll be serving your guests the best-tasting barbecue ever! 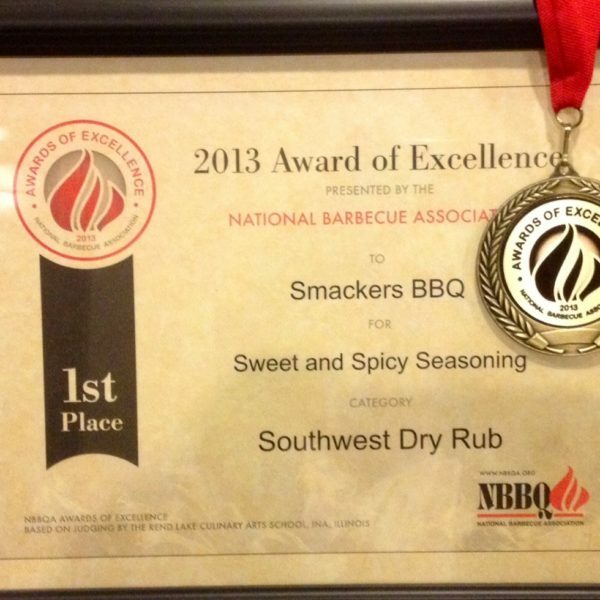 This is one sauce you can use year-round. 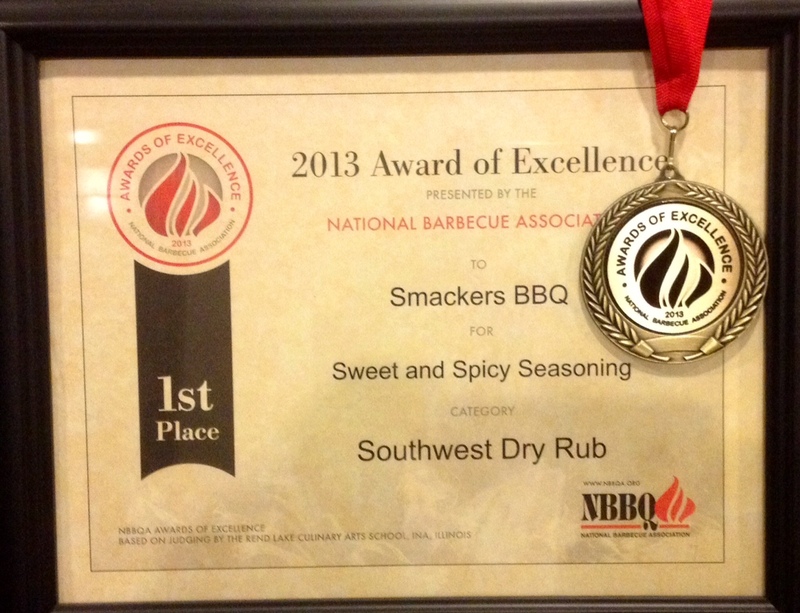 Even when it’s snowing outside, try it on your favorite foods cooked on an indoor electric grill or in the oven. If you are worried about gluten free, rest assured that there is no wheat added to any of our products, although products are processed in a facility that may have previously processed gluten. 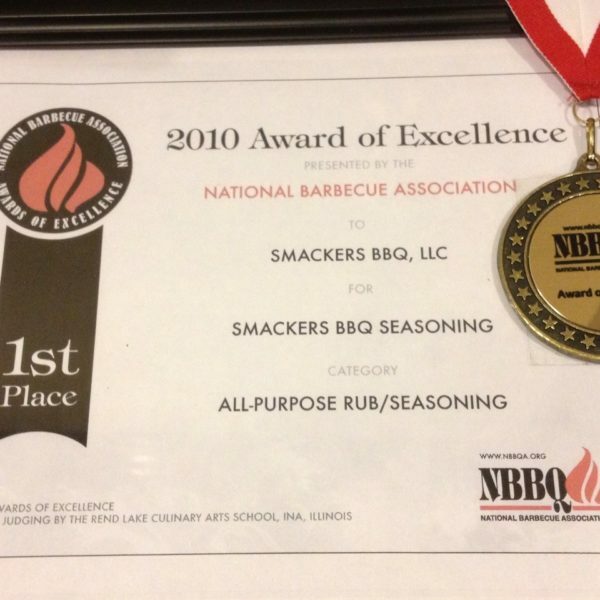 Follow Smackers BBQ on Facebook for tips, tricks and videos! Don't forget to order a few extra bottles for yourself! 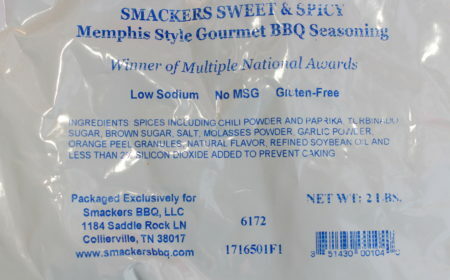 This assortment will arrive packed with festive cellophane and decorative shred, and is sure to create excitement in the kitchen and around the grill! 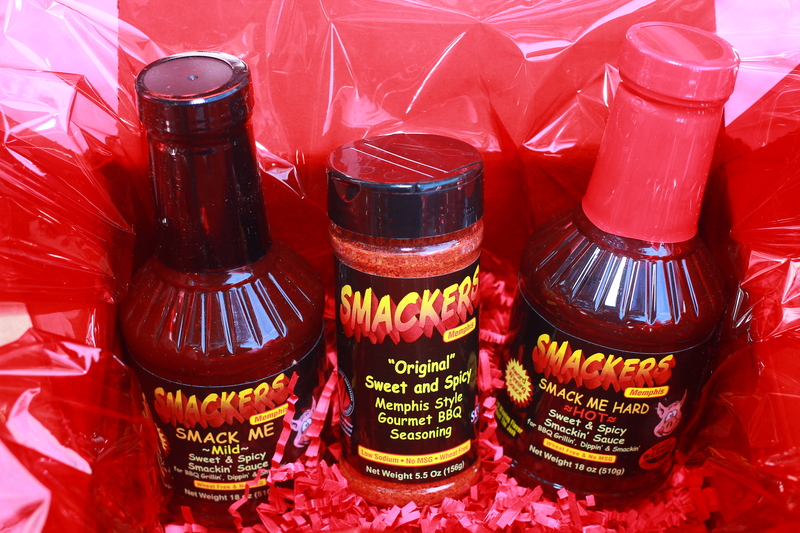 The Premium Memphis Gift Basket, all three of Smackers multiple award-winning BBQ products! 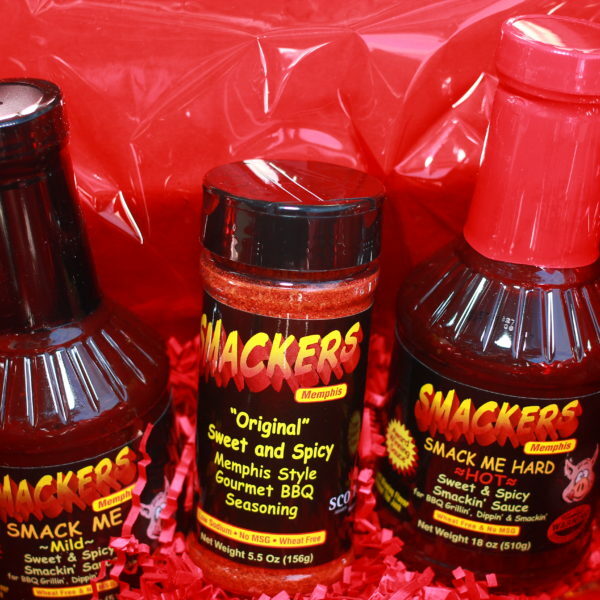 Begin grilling with Smackers Sweet and Spicy Rub, add another dusting after cooking your meal, and finish with your choice of sauce. You'll want to have a bowl of each sauce handy for your guests to enjoy with everything on their plate! 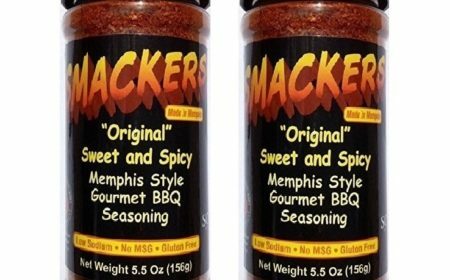 Home / Smackers Premium Memphis Gift Assortment BBQ Seasoning and Sauces Great Gift! 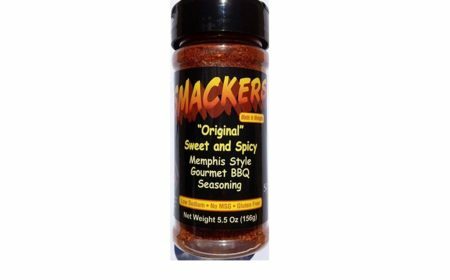 Smackers Sweet and Spicy Memphis Style Seasoning, 5.5 oz. 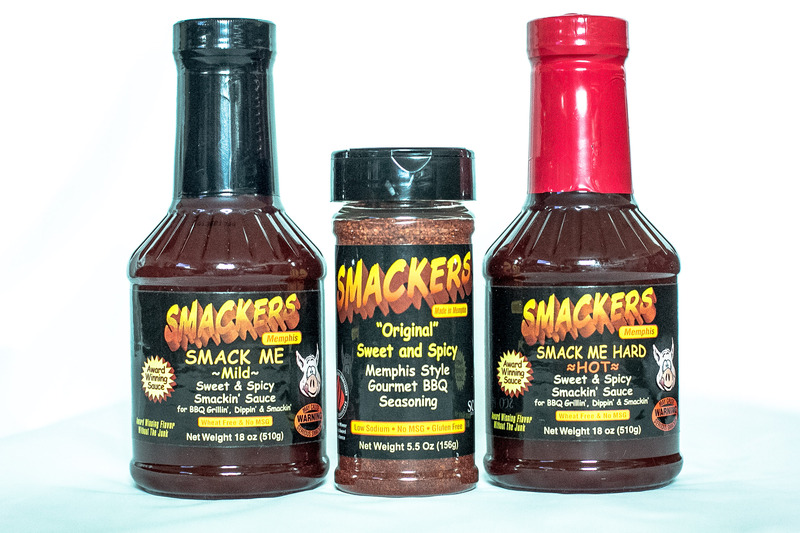 Begin with Smackers Seasoning for your main dish, and serve with a side of each of our perfectly balanced sauces. It’s the perfect gift to give yourself, too! 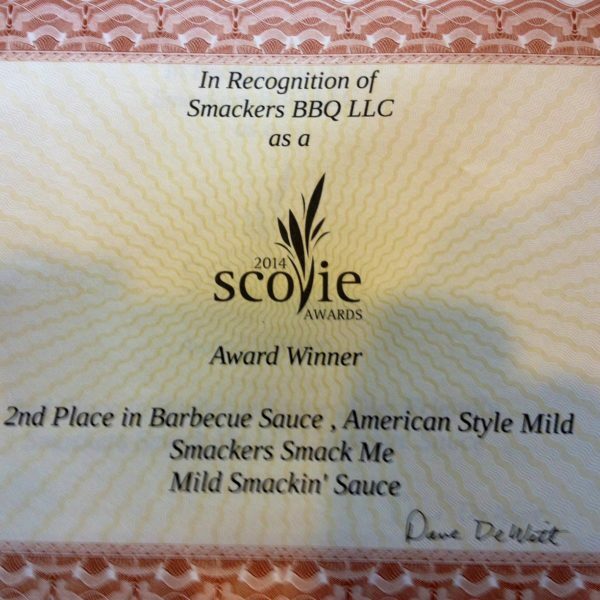 Make sure to check out our Facebook page for recipes and a how-to video that will have you cooking perfect ribs, chicken, shoulders, wings and even seafood like a pro! 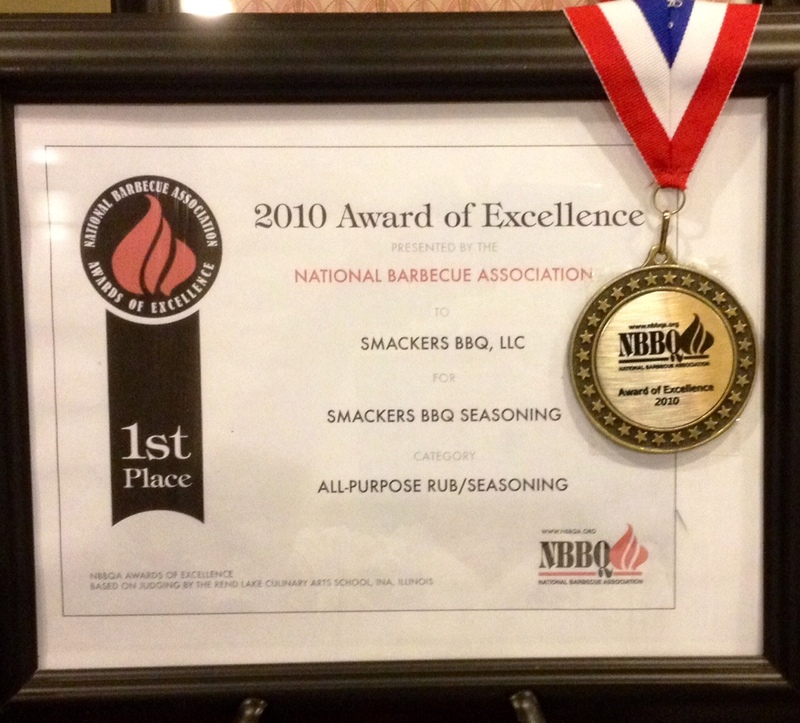 Smackers contains remium ingredients for a full-bodied experience like no other! 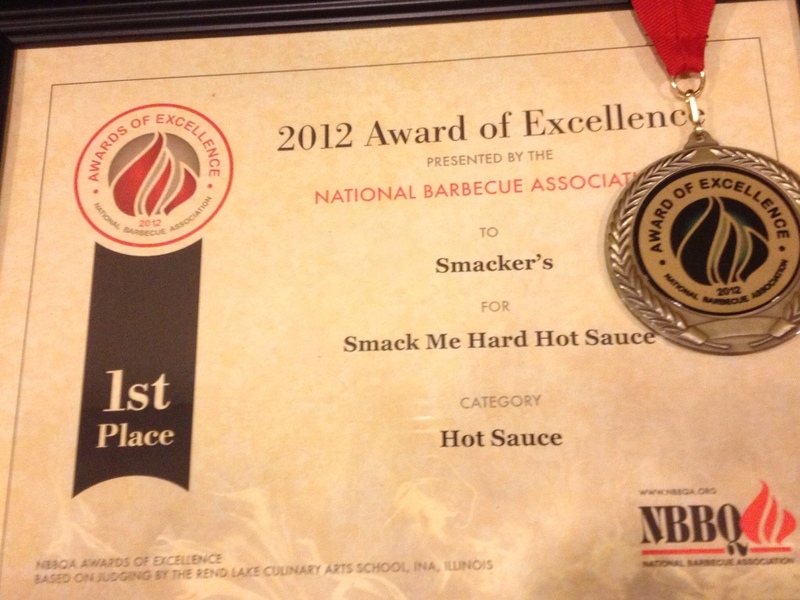 Smackers sauces are made using our award-winning Smackers Sweet and Spicy BBQ Seasoning, so you know you’ll be serving your guests the best-tasting barbecue ever! This is one sauce you can use year-round. 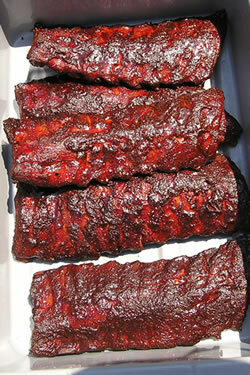 Even when it’s snowing outside, try it on your favorite foods cooked on an indoor electric grill or in the oven. If you are worried about gluten free, rest assured that there is no wheat added to any of our products, although products are processed in a facility that may have previously processed gluten. 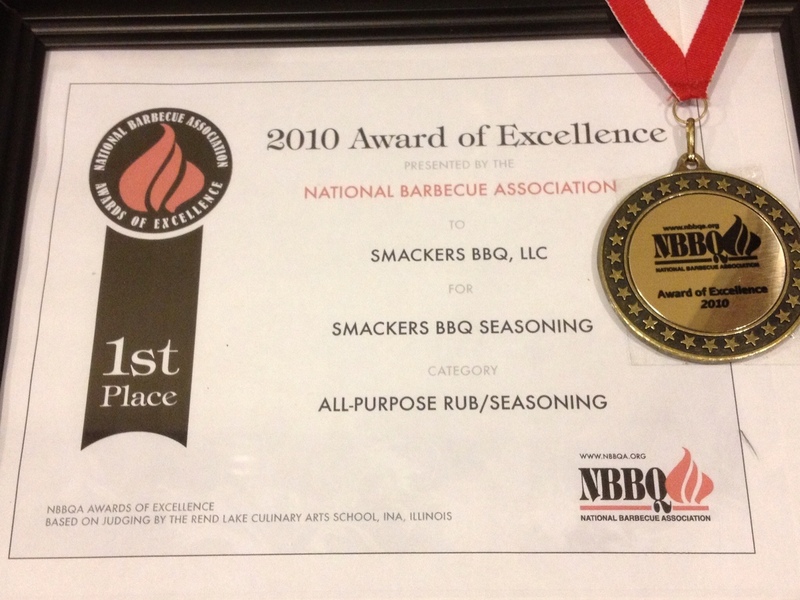 Follow Smackers BBQ on Facebook for tips, tricks and videos! Don’t forget to order a few extra bottles for yourself! This assortment will arrive packed with festive cellophane and decorative shred, and is sure to create excitement in the kitchen and around the grill! 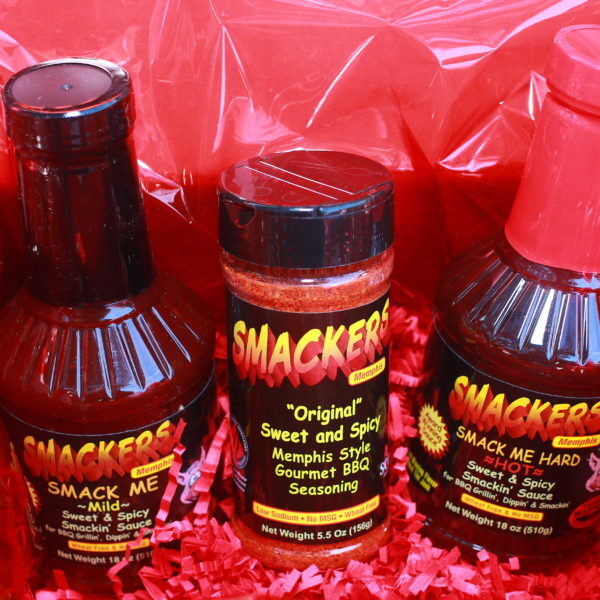 The Premium Memphis Gift Basket, all three of Smackers multiple award-winning BBQ products! 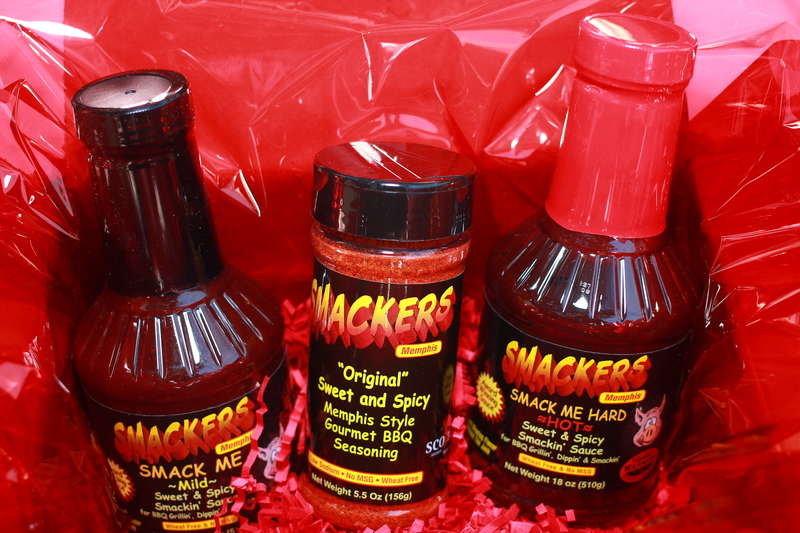 Begin grilling with Smackers Sweet and Spicy Rub, add another dusting after cooking your meal, and finish with your choice of sauce. You’ll want to have a bowl of each sauce handy for your guests to enjoy with everything on their plate!